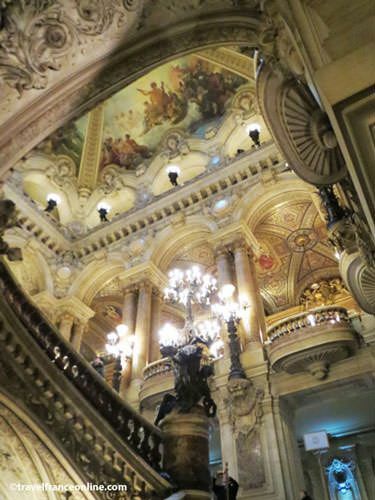 The Opera Garnier is also known as Palais Garnier to pay tribute to its architect Charles Garnier. Its construction, declared of public utility with a decree of 1860, was a major event. The square and the Avenue Napoléon (current Avenue de l'Opéra) were indeed especially created to showcase the building! The first stone was laid on July 1, 1862. However, the discovery of an underground lake, the remnant of an ancient arm of the Seine, slowed the works. Garnier installed several pumps, but it still took 8 months to empty the lake. Once the water drained, he built a massive brick and concrete waterproof tank to underpin the building and isolate it from further infiltration. This incident inspired Gaston Leroux when he wrote The Phantom of the Opera. His best-seller novel, published in 1909, gained international fame in 1986 when Andrew Lloyd Weber adapted it into a musical. The Franco-Prussian War of 1870-71 and the riots of the Commune of Paris once more delayed the completion of the building. 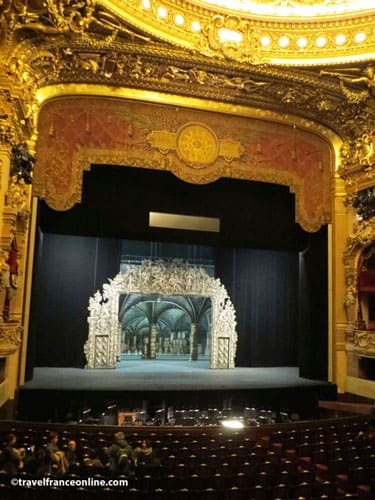 President Mac-Mahon eventually inaugurated the Opera Garnier on January 5, 1875. 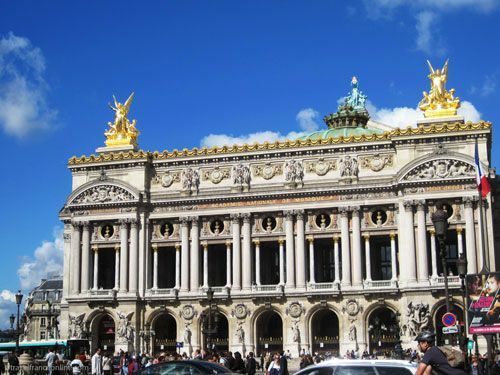 The Opera is considered the masterpiece of Garnier and a perfect illustration of Neoclassical architecture. 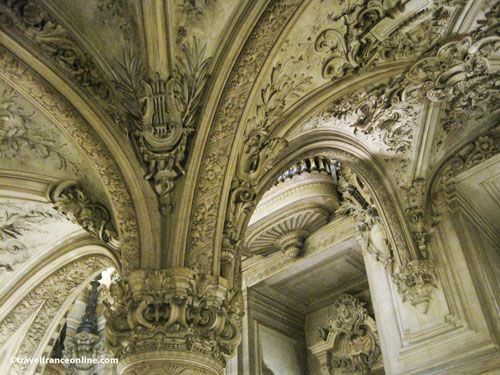 The lavish style of the Second Empire often combines balance and purity of form with an eclectic and heavy decoration. Indeed, the building’s monumental facade (172m long by 101m wide) boasts an exceptional architectural unity and balance. Four allegorical groups adorn the street level arches. François Jouffroy sculpted L'Harmonie or Poétrie (Harmony or Poetry); Jean-Baptiste Claude Eugène Guillaume sculpted La Musique Instrumentale (Instrumental Music); Jean-Joseph Perraud Le Drame Lyrique (Lyrical Drama) and Jean-Baptiste Carpeaux La Danse. 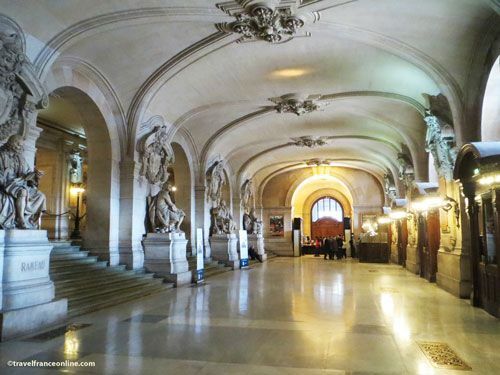 These arches support 7 loggias framed by Corinthian columns and topped by a wide frieze decorated with masks. 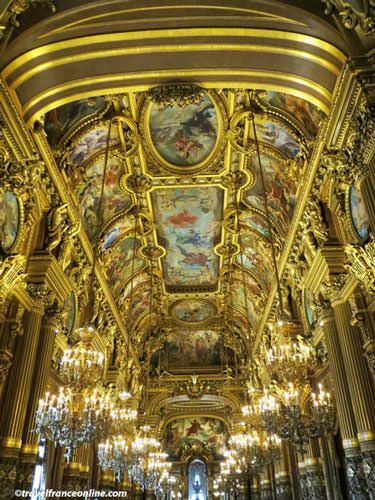 Charles Guméry sculpted Harmonie and Poétrie that top each facade end and Millet the golden statue of Apollo the Greek God of the Arts playing his lyre that crowns the dome roof. The interior decoration is equally lavish and extravagant! 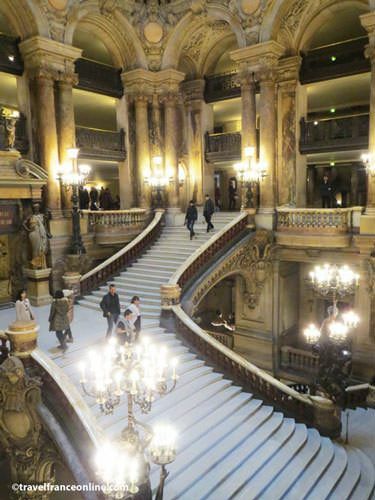 The monumental grand staircase is made from the purest Carrara marble and leads to the Grand Foyer. This 154m long by 13m wide and 18m high hall served as a drawing room for the elegant society of the time. 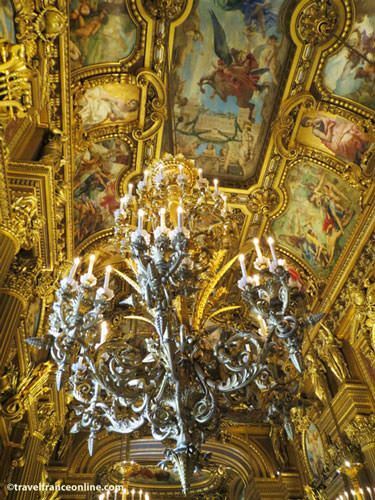 It boasts a wealth of polychrome marble, gilding, paintings and heavy draperies. 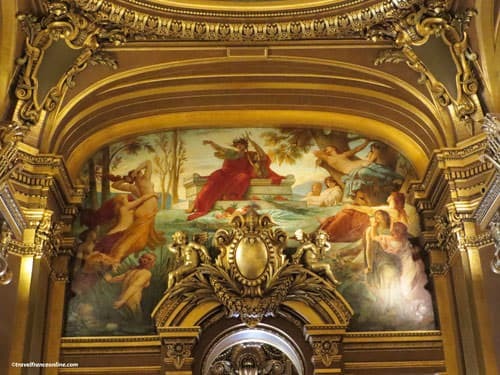 Paul-Jacques-Aimé Baudry painted the ceilings and murals with scenes related to the history of music. 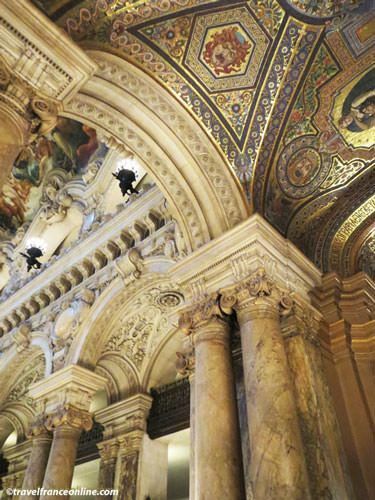 The theatre’s loggia spread on 5 levels, each lavishly adorned with red velvet and gilding. 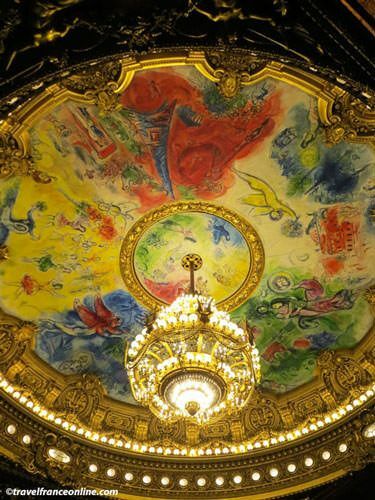 The gigantic six-ton chandelier marks the centre of the false ceiling painted by Chagall in 1964. The building sits on five basements. A multitude of footbridges and platforms, used by the machinists to operate the decors, interconnect these basements. 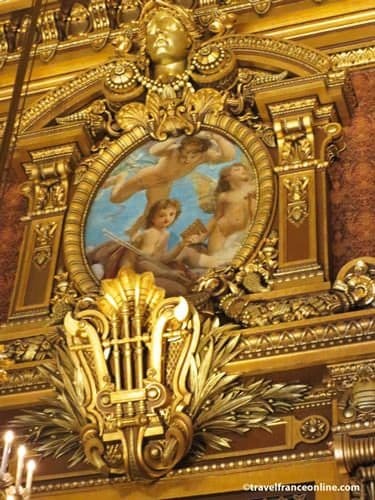 The Opera Garnier was modernized in 1937 and 1952 and in recent years when gilding was cleaned and restored. 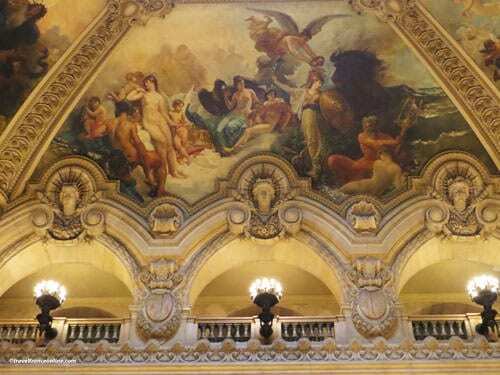 The Opera Garnier - National Academy of Dance and Music is the largest opera house in the world; it has a capacity of 2,200 seats and its stage is large enough to accommodate 450 artists. 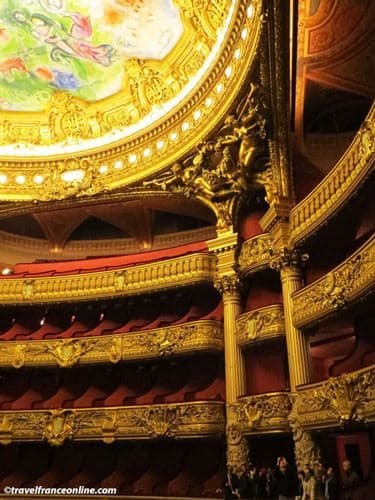 It is today entirely devoted to ballet, while most operas are produced at the Opéra-Bastille.